Gus had a milestone this week. Or maybe we both did. In a matter of days, he became officially weaned. Officially no longer a baby. Okay, I can guess what you are thinking right now. But before you hit “delete,” this is not a post about the virtues of nursing your child. I have never found those diatribes to be particularly helpful. I don’t think this is a post about mourning the loss of babyhood either. I am sure I will change my mind in a few years, but the boys seem to be growing at a good pace right now. 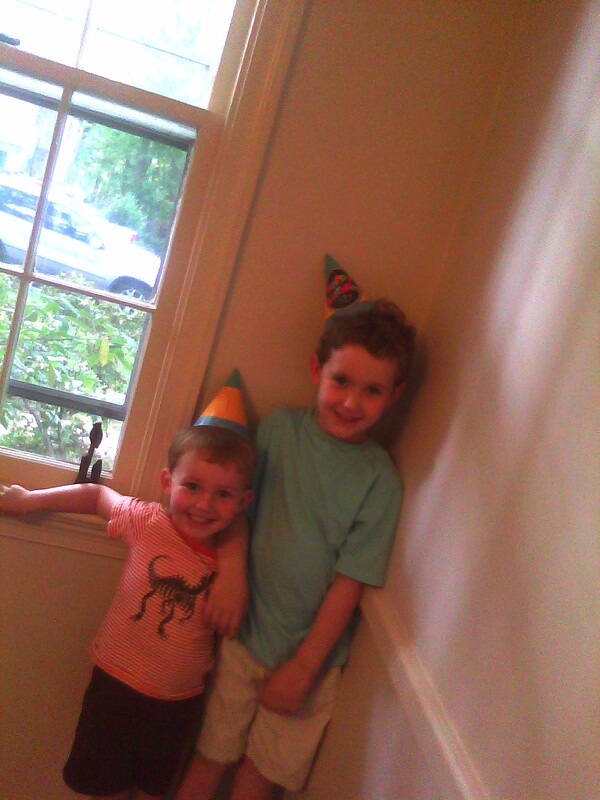 I think if they grew up any more slowly, I might collapse under the weight of diapers. Or from exhaustion. Life is so much easier now than even a year ago, and it gets more interesting and fun each day. I think I might be writing about how awestruck I am by how gracefully my two and a half year old was able to let go of something he loved. Something that made him feel safe. For the last few days I have been thinking about the death grip I have on my own creature comforts. I have been noticing that I even hold onto things that I no longer need. The list is long but it includes worry, fear, anxiety, and doubt. The very process of helping my son let go of his babyhood seemed to bring all of my own fears to the surface. First, there was the fact that I had to decide this, that I had to be in charge. I waited a while for the real grown-up to appear. I scoured many parenting books and called friends and even a lactation consultant back in California. Still, Mary Poppins failed to materialize at my door. Instead, I went to the dentist, who told me that the impacted wisdom tooth, which has been bothering me for years, really needs to come out now. He wants to implant some artificial powdered bone in my jaw, and the whole procedure requires a slew of sedatives and painkillers that kids don’t need in their bodies. I came home and realized it was time to say No to my son. And saying No is something I hate doing. To anyone. Recently, I mustered up all my courage and told my son’s school that I could not work on the newsletter during the next school year because I have no free time, and what happened next? I am suddenly in charge of the school’s silent auction. I say suddenly as if these things just happen to me. As if I have no agency here, in the matter of my own life. On the first day I told Gus “No,” he cried for about five seconds while my gut twisted in agony. “Gus, do you want to get some books?” I asked holding him tightly. He wailed and pushed me away. “Let’s get your blanket,”I suggested, trying again. The lactation consultant told me to remind Gus of all the ways he can get comfort from me and of all the ways he can comfort himself. More wailing. And then, he was quiet. Solemnly, he blinked the tears from his eyes. “I want to play cards,” he said and slid from my bed. I watched him run off like the world’s smallest gambler and waited for what would happen next. A few seconds later, Gus returned, holding his pack of Curious George Animal Rummy playing cards. I helped him back up on the bed and watched him deal. Literally. There are still so many things I don’t want to deal with. There are so many aspects of myself I don’t want to know about. And yet, it’s funny, how when you shine a little light into those places, it’s never quite as bad as you think. This morning I emailed the school’s Silent Auction Committee and told them I couldn’t do it. I still feel awful about it. Irresponsible. Unreliable. Careless. But under that, I am also relieved. I think of how cranky I would be after staying up night after night, putting together an auction book, worrying about whether or not other people were doing their jobs. I think of how mad I would get a the boys for making noise while I was on the phone, trying to get a merchant to donate a free bike tuneup, or dinner for four. I think about how impossible it would be to get anyone to donate anything with my boys running around their store. On the morning of Gus’s milestone, I decided to have a party, inspired by Kristin Noelle’s recent post. For once in my life, I was going to run towards something and not away. As Gus dealt the cards for animal rummy on the bed, I told him about it. “Can I have bawoons mommy?” he asked as he lined up his cards on the sheets. There was George, the Man with the Yellow Hat, Hundley the Dog. “Um, no,” I said, for the second time that day. It didn’t really feel any easier to say no this time. Maybe it will always be hard. “You have to eat your vegetables first,” I instructed. I’ve lost count of how many times I’ve said that line. The party consisted of the boys mowing their way through their cupcakes, frosting first and then chasing each other around the living room with their balloons. For once I didn’t tell them to stop, that someone was going to get hurt, that it was almost time for bed and that they needed to slow down. I thought of my brave little guy who decided it was okay to give something up. That instead of making a huge deal about it, he was going to play the hand he was dealt and have a party. After chasing each other around the dining room, Oliver decided to tie their balloons to their big Bruder trucks and run around with those. They made a loop through the living room, the dining room, and the kitchen, their balloons trailing over them with their bright messages. Congrats. Get Well Soon. Good Luck. Look at you, and those incredible boys of yours. Just look at you – learning everyday, finding a way to embrace change, to learn to let go and to charge ahead to find what it next. Bravo on all fronts and thank you for letting me watch it all unfold. I so admire your ability here, Pamela, to distinguish between the ways in which this transition was hard for you and the ways in which it was hard for Gus. Too often, I think that I project my own issues onto my kids (my own inability to say no and then to feel burdened under the weight of too many yeses tops the list) and I end up confusing which one of us is having a hard time. Thank you for sharing this lovely story. Congrats. Get Well Soon. Good Luck indeed. I can’t even say how much I love this. A party! With cupcakes and balloons!! Completely teared up again. This is just beautiful. Thanks. I echo what everyone else said. I am so inspired by how you see your life and how you put that vision to words. I love love love this. Yes, yes, yes, to this post and to the comments. I suppose it’s what brings us all together here in this online world, our mutual understanding of how hard it is to let go, and move and to appreciate that good enough really is good enough. My oldest son self-weaned at 1 and then my second, who I was really hoping would keep nursing until 2, weaned at 16 months. I was grateful that it was their decision, but really struggled with what it meant to me. I love that you decided to celebrate this change, we should do more of that in our lives. I feel very inspired by how well you tell your stories, the bits and pieces you pull together here. I feel as thought your showing me the way. Also. you sound like a great Mom. Early childhood is filled with such lovely (bittersweet) moments, as children learn to let go more readily than we do, at times. Congratulations on the milestone. You are amazing doing it till 2.5 year old. I came here after reading your comment to Mrs. Chicken and I have to say, I love this post and the comments! Drat! I don’t have time for another blog to love! What an awesome idea to have a party for him. And a beautiful post about how you got there. The entire parenting experience seems to be a training ground for learning to let go with grace and fortitude. My sons continue to be a shining example of how to do that but it still doesn’t come easy for me. Thanks for giving a voice to so much that I feel in your very eloquent post! Been wondering how yall are doing with this……. Hi, coming here via the lovely Motherese. First off, I love that you had a party for the milestone. Brilliant idea! I think I will do that for the binky ween just around the corner. You are currently reading Letting Go at Walking on My Hands.